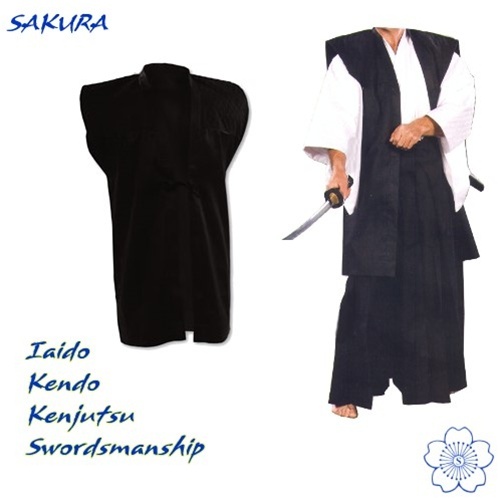 Related to my uniform suggestion - a haori like this (the outer jacket).. I like this sleeveless variety, since it can be thrown on top of any other outfit - shorter sleeve holes (this pic is kind of strange).. but the same idea - with some kind of large symbol on the back and smaller one(s) on the front/name and any approved custom decorations/whathaveyou. going along with the large kamon on the back and the smaller one's on the front, I think Honor guard should have the imperial Mon (the sakura moon symbol) and naturally Satsubatsu gumi should have the five ring symbol. I also think Admins should get jinbaori, its the same thing but with sleeves. your opinion? ok so actually, haori have sleeves and jinbaori do not. I was looking for the name for it forever! So, yeah, that. I have one almost finished but ran out of some fabric for the sleeve hem (oops XD).. back to Joann's 2m I guess.